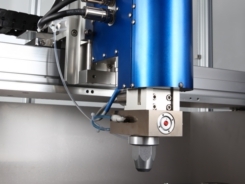 High Precision Spray Coater - Texmac Inc.
Monolithic spray head to realize the discharge accuracy 0.1-1.0% by its own flow control technology DLCS ™ developed (Digital Liquid Control System). Original two-fluid nozzle, the sub-tank, and so on degassing mechanism is integral, not pulsations occur, also has become a clogging offend neither the structure of the nozzle. 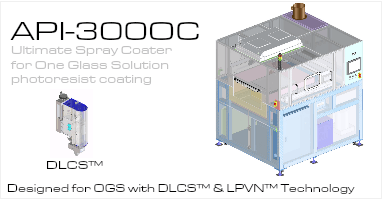 Years of spray coating process expertise spray coating control technology designed based on. 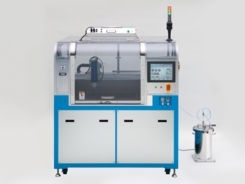 Set of application parameters, the nozzle cleaning, bubble opener, recoating, such as the monitoring system of the application state, you can operate the control of any system on the 12㌅ touch panel. 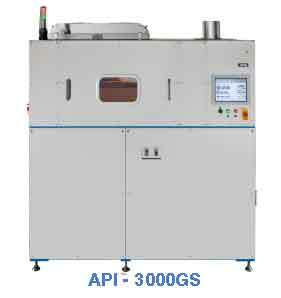 In addition, the coating conditions from temperature and humidity, the data up to the device status at the time of application operation that is recorded as log data, making it possible to feedback to the mass-production management. 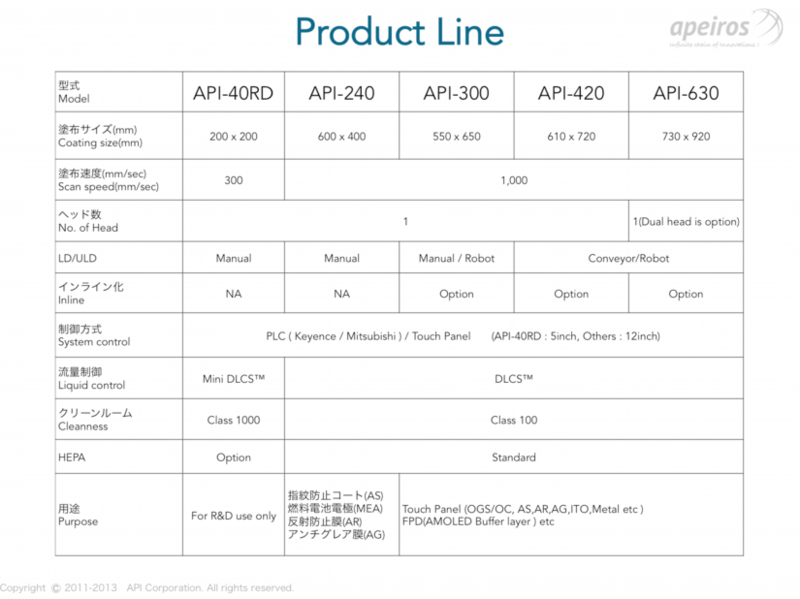 Standard Model API-240. 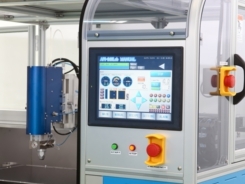 The touch panel of the anti-fingerprint coatings, AG / AR coatings, such as a fuel cell electrode coating, conventional coating processes (slit die, a roll coater, a spin coater) and by resolving the respective unique challenges, adoption in mass production is expanding. Smartphone, in mounted on a tablet PC, touch panel market is rapidly expanding. Lighter, but a variety of new technologies to thinner have been developed, big favorite already cover glass-integrated touch panel mass production has been started as a common name for the next generation touch panel Among them: OGS of (One Glass Solution) formed to develop a membrane process for devices API-300OC, we start accepting orders. Excellent film thickness uniformity compared to conventional spray coating, it will improve the yield at the time of mass production. 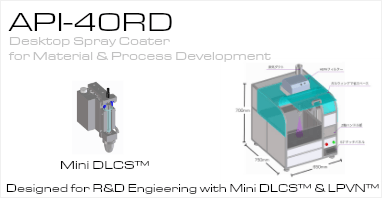 Ejection accuracy 1% of the flow rate control technology DLCS tabletop precision spray coater API-40RD which is equipped with a Mini DLCS ™ was a compact ™. Use a disposable syringe head, because that can be precisely applied experiment with a chemical solution of about minimum 3cc, Tegaeshi well, and a minimum of material, it becomes possible to material development and process development in the effort. Tabletop while, a HEPA filter and the adsorption stage as standard equipment, for which it is possible to uniformly apply the fine particles of the 10-15μ by LPVN ™, and excellent scalability to mass-production process. Apple, in the wake of the adoption of the iPhone 3GS, almost all of the smart phone, the fingerprint resistance oil repellent coating technology that was to be coated with genuine in tablet PC (glass touch panel), which is sold in the current world.Conventionally, had been deposited in a very expensive vacuum deposition apparatus, with the increase in the size of the touch panel size, such as a tablet PC, it has been rapidly increasing manufacturers to adopt a spray coating in the last few years, our technology global It offers a spray coating technology on the touch panel manufacturer. 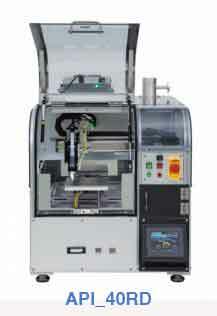 In addition, this technology as it is for general consumer those commercialization will be “Fussode COAT ™” series. 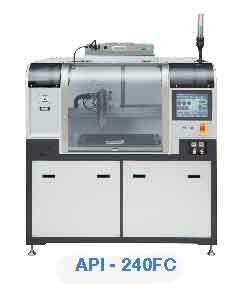 The device to our coating technology development center / Technology Lab & fab a permanent, your prototype development, accept equipment evaluation test, the contract processing for a fee.